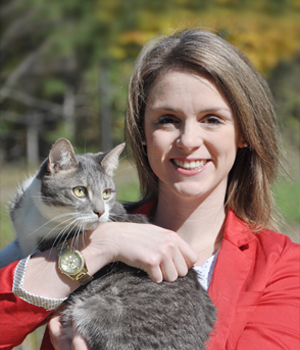 Dr. Katie Morin graduated from the Ontario Veterinary College (OVC) at the University of Guelph in 2012. No stranger to the beautiful and welcoming University of Guelph, she also holds Bachelor of Science (Honours) and Masters of Science degrees in Biomedical Science, obtained in 2007 and 2008 respectively. Originally from Ottawa, Katie demonstrated keen interest in and passion for animals/veterinary medicine from a young age, particularly due to her beloved childhood pets Jonas (Labrador Retriever) and Felicity (Calico cat). Katie joined the Campus Estates Animal Hospital team in September 2007 and gained invaluable experience in customer care, animal care, preventative medicine and emergency medicine. She was lucky to have continued gaining this experience while going though veterinary school as well. She is thrilled and absolutely honoured to have joined the team as a veterinarian in May 2012! Katie enjoys working with and learning about companion and exotic animals alike, with particular interest in both preventative and emergency medicine. She also takes great pride in forming meaningful bonds with all of the ‘pet parents’ she has the pleasure of meeting on a daily basis. Outside of the clinic, Katie enjoys running, playing soccer and spending time with friends and family (and visits her family and two cats, Shreddie and Fiona, in Ottawa as much as possible!) Currently, Katie is proud to call Guelph home, with her two rescue cats, Harold and Sally.